M Gymkhana® Is a Motorcycle Sport Designed To Challenge a Rider’s Ability To Navigate a Pre-Designed Course In The Shortest Amount Of Time With The Least Amount Of Errors. It Is An Open Displacement Competition That Is All About a Rider’s Skill and Ability Rather Than About How Much Or How Little Horsepower a Particular Motorcycle Can Produced. The Playing Field Has Been Leveled and Is Not Based On How Big a Rider’s Budget Is. All That Is Required To Participate Is a Willingness To Improve and Learn, Along With a M1 License and a Road Legal Motorcycle. With These Components You Can Exponentially Improve Your Throttle Control, Steering and Braking Ability; and Push Your Skills In Ways Never Thought Possible On a Motorcycle. No Need To Be Embarrassed, You Will See Improvement With Each Session!! M Gymkhana® Is An Experience You Will Never Forget and You’ll Be Hooked After The First Session Of The Day. All Of This Is Available To You On a Limited Budget and Close To Home!! It’s a Great Sport That Encourages Healthy, Friendly Competition and Will Give You Life Long Friends In The Process!! You navigate around cones according to cone color. The colors will let you know which direction to travel in. 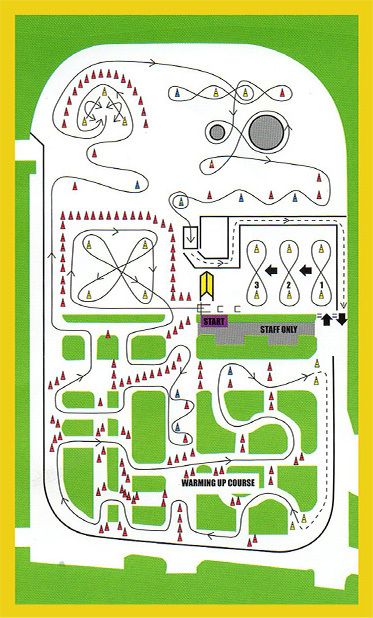 A sample course design is shown to the right. The exciting thing is that course design changes every competition which keeps you guessing!!! How do you get this good? Practice, Practice, Practice!! It’s Your Turn To Try It For Yourself!!! !Put Your Skills To The Test. Improve Your Riding Ability Exponentially By Trying Out M Gymkhana®! It’s The Most Fun You Can Have On Two Wheels That’s Legal, Affordable and Is Guaranteed To Make You a Better Rider On The Street and Track!! !